Long summer evenings are just made for sitting in the garden. It can be just too hot to spend lots of time outdoors during the day, so it makes sense to add some night-time interest to the areas where you linger as night falls. Use a combination of colour and fragrance to enhance the experience. When it comes to colour, light tones will be more visible than dark ones, so plants with these tones in flower or foliage or both will work well. Some flowers are markedly more fragrant around dusk, so these will be ideal. My favourite night-time garden plant is the brugmansia x candida (angel's trumpet). 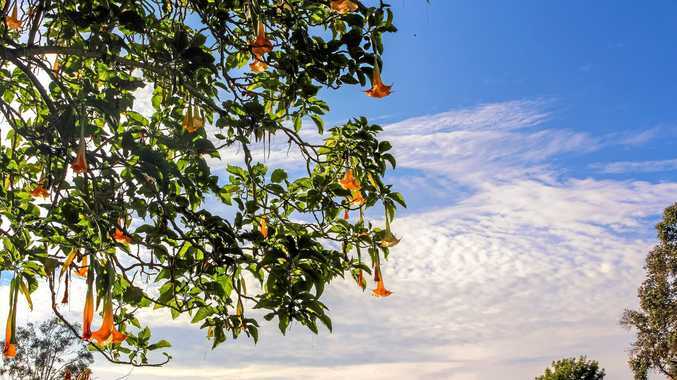 These small trees grow rapidly to about 3m tall, and have masses of huge pendulous trumpets that are heavily scented, especially in the evening. They are poisonous, so don't eat them or smoke them, but they look and smell just wonderful on a summer evening. I especially love the white-flowering ones, but the pinks, yellows and apricots are also stunning. Frangipanis, of course, are another summer fragrant delight, and are brilliant in pots or in the ground. One plant that I would love to be able to recommend is the night scented jasmine (cestrum nocturnum) but unfortunately this has become very invasive here in the sub-tropics and is no longer usually available for sale. I do hope that some enterprising plant breeder will be able to develop a sterile form so that we can enjoy its heady, spicy fragrance once again. Fortunately, there are plenty of alternatives, including gardenias, port wine magnolia (michelia figo), and osmanthus fragrans. Like gardenias, chinese star jasmine (trachelosperemum jasminoides) is both white-flowering and fragrant, so it's perfect for this application. The night-blooming cactus, especially cereus spp and epiphyllum, produce spectacular and heavily fragrant white flowers in the evening in summer. The blooms last for one night only, so make sure you keep these babies close by so you don't miss the show. You can grow them in hanging baskets or in pots, or let them climb a tree or cover a sturdy structure. They are best in morning sun or filtered light, rather than full sun.